CAPE CANAVERAL, Florida -- The nation's space exploration program is taking a critical step forward with a successful major technical review of the core stage of the Space Launch System (SLS), the rocket that will take astronauts farther into space from Kennedy Space Center in Florida than ever before. The core stage is the heart of the heavy-lift launch vehicle. It will stand more than 200 feet (61 meters) tall with a diameter of 27.5 feet (8.4 meters). NASA's Marshall Space Flight Center in Huntsville, Ala., hosted a comprehensive review. Engineers from NASA and The Boeing Co. of Huntsville presented a full set of system requirements, design concepts and production approaches to technical reviewers and the independent review board. "This meeting validates our design requirements for the core stage of the nation's heavy-lift rocket and is the first major checkpoint for our team," said Tony Lavoie, manager of the SLS Stages Element at Marshall. "Getting to this point took a lot of hard work, and I'm proud of the collaboration between NASA and our partners at Boeing. Now that we have completed this review, we go from requirements to real blueprints. We are right on track to deliver the core stage for the SLS program." The core stage will store liquid hydrogen and liquid oxygen to feed the rocket's four RS-25 engines, all of which will be former space shuttle main engines for the first few flights. The SLS Program has an inventory of 16 RS-25 flight engines that successfully operated for the life of the Space Shuttle Program. Like the space shuttle, SLS also will be powered initially by two solid rocket boosters on the sides of the launch vehicle. The SLS will launch NASA's Orion spacecraft and other payloads, and provide an entirely new capability for human exploration beyond low Earth orbit. Designed to be safe, affordable and flexible for crew and cargo missions, the SLS will continue America's journey of discovery and exploration to destinations including nearby asteroids, Lagrange points, the moon and ultimately, Mars. "This is a very exciting time for the country and NASA as important achievements are made on the most advanced hardware ever designed for human space flight," said William Gerstenmaier, associate administrator for the Human Exploration Operations Mission Directorate at NASA Headquarters in Washington. "The SLS will power a new generation of exploration missions beyond low Earth orbit and the moon, pushing the frontiers of discovery forward. The innovations being made now, and the hardware being delivered and tested, are all testaments to the ability of the U.S. aerospace workforce to make the dream of deeper solar system exploration by humans a reality in our lifetimes." The first test flight of NASA's Space Launch System, which will feature a configuration for a 77-ton (70-metric-ton) lift capacity, is scheduled for 2017. 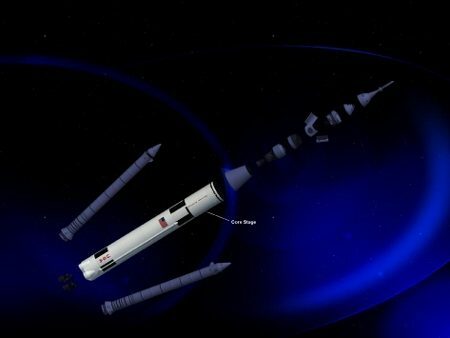 As SLS evolves, a two-stage launch vehicle configuration will provide a lift capability of 143 tons (130 metric tons) to enable missions beyond low Earth orbit and support deep space exploration. Boeing is the prime contractor for the SLS core stage, including its avionics. The core stage will be built at NASA's Michoud Assembly Facility in New Orleans using state-of-the-art manufacturing equipment. Marshall manages the SLS Program for the agency. Across the SLS Program, swift progress is being made on several elements. The J-2X upper-stage rocket engine, developed by Pratt & Whitney Rocketdyne for the future two-stage SLS, is being tested at Stennis Space Center in Mississippi. The prime contractor for the five-segment solid rocket boosters, ATK of Brigham City, Utah, has begun processing its first SLS hardware components in preparation for an initial qualification test in 2013.